The client's brief was for a small but comfortable Passive Solar home to fit this unique rural site with its restricted building platform due to soft ground. 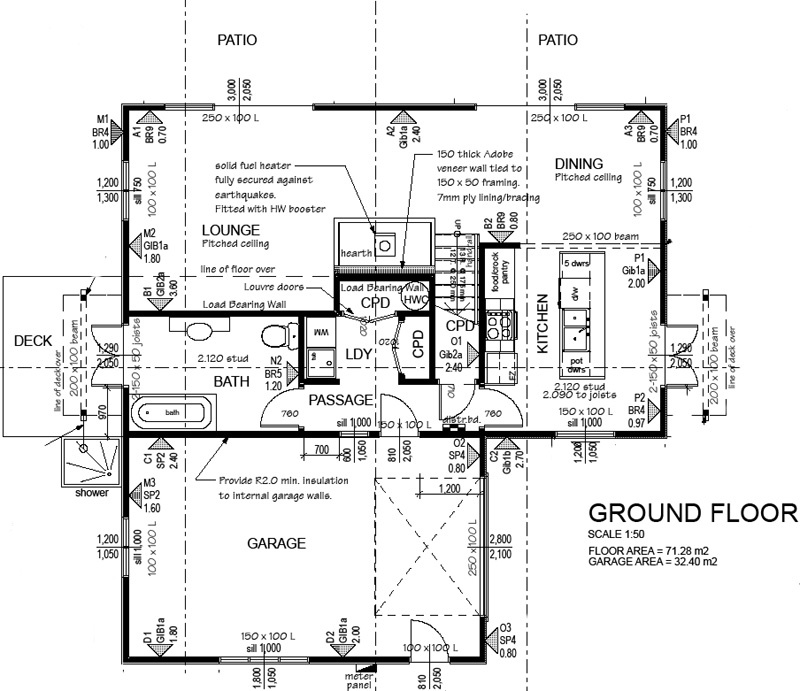 My solution was to create a very compact yet interesting dwelling using the limited loft areas as mezzanine bedrooms to the main living that also enabled better heat circulation and the impression of more space. Spaces under the loft are only 2.1m stud height so the ceiling was left off in the kitchen to create more volume here while making a feature of the floor joists texture. The original 2 BR version of this popular passive solar cottage with mezzanine bedrooms. 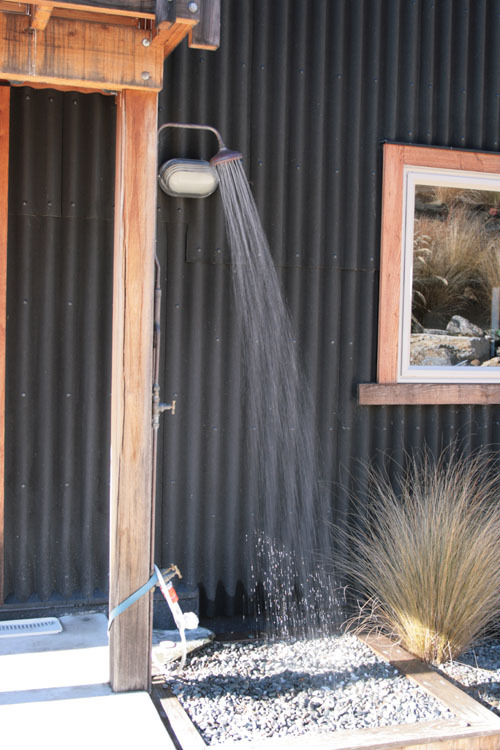 Materials are Black Onduline corrugated cladding with Macrocarpa timber facings to windows and corners. Recent view showing north facing solar gain glazing and Velux roof windows for additional gain in spring conditions. 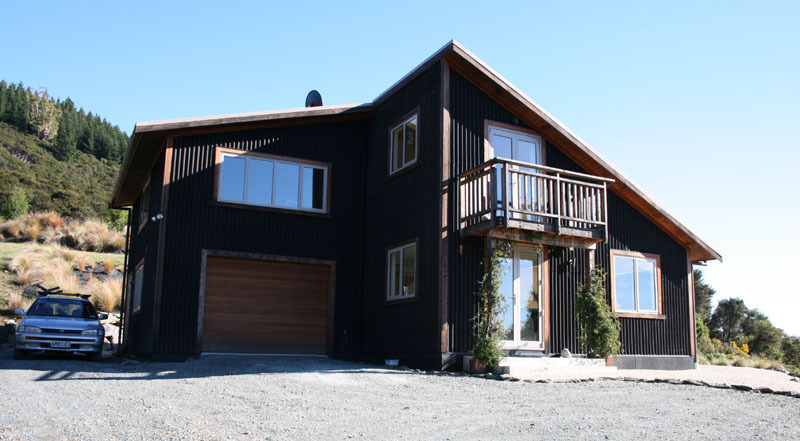 Materials are Black Onduline corrugated cladding with Larch timber facings to windows and corners. 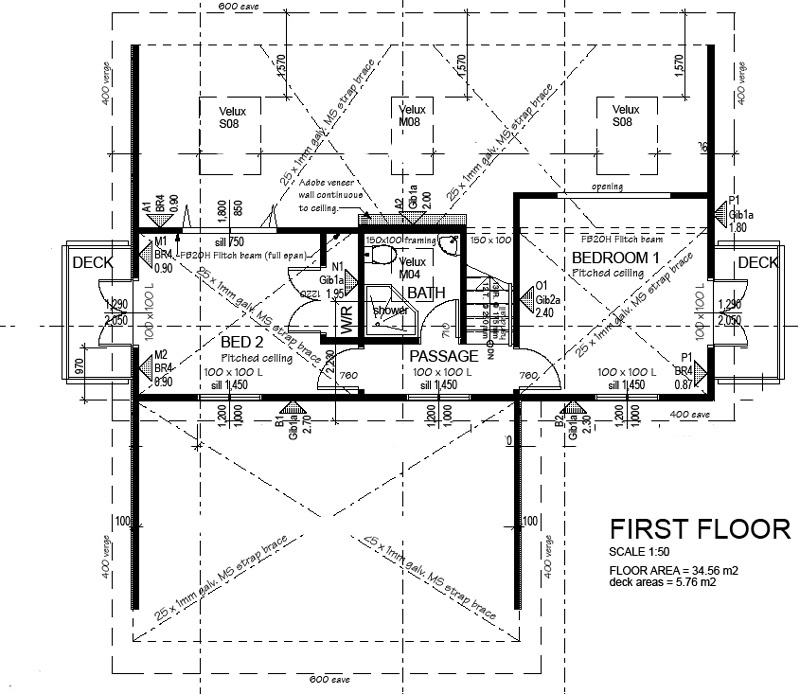 Slab and foundation perimeter are insulated with protected polystyrene. I have produced a building that needs virtually no additional heating with early morning air temperatures being reported at 16 degrees even after frosty nights. 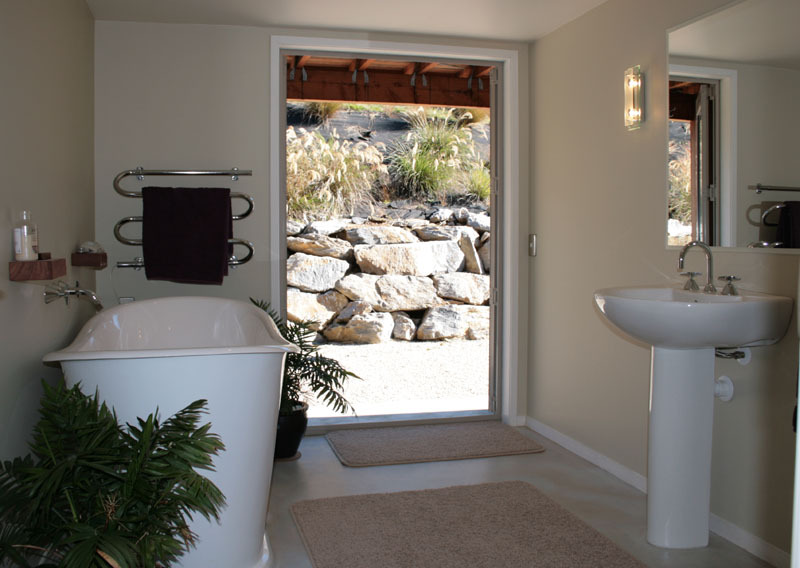 The radiant heat of a passive solar home creates comfort levels that allow slightly lower air temperatures without discomfort because all internal materials are radiating heat as they cool down. The log fire installed as back up heating is hardly ever used, yet even here the adobe veneer mass wall stores excess heat from the fire for later use. The two main north solar gain glazed openings are supplemented by three Velux roof windows which compensate for high sun angles in spring and early summer when solar gain is still needed to warm the thermal mass. These roof lites also enable views to be seen from the loft bedrooms and allow passive ventilation in summer. Recent view from the South East with large master bedroom & Ensuite etc built over Garage at rear - this was a last minute addition to increase the property value and as such the only part of the house not passive solar heated but serves to take excess heat from sunny rooms. 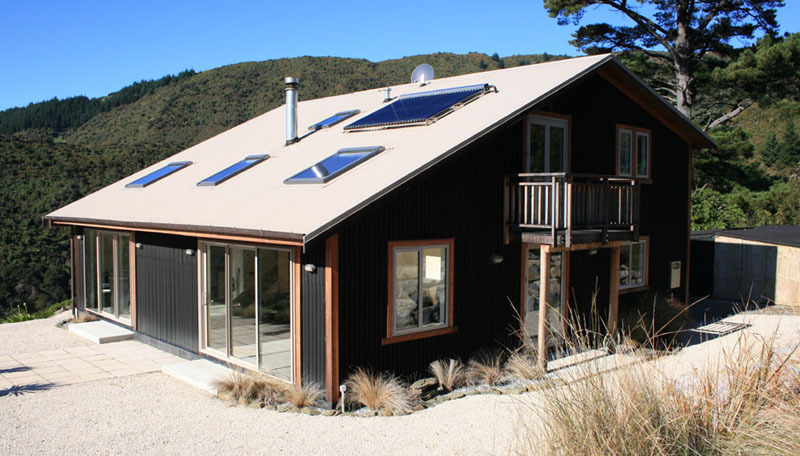 Onduline corrugated cladding (a low cost recycled cardboard product) is used outside with local stained Larch timber facings at corners and windows etc. All building envelope elements are fully insulated with Nelson’s own Latitude ‘Woolbloc’ insulation while the 150 thick exposed concrete floor slab (for extra thermal mass) is insulated both under and around the perimeter with polystyrene. The floor is finished with Bio Paints 'Stone Oil'. 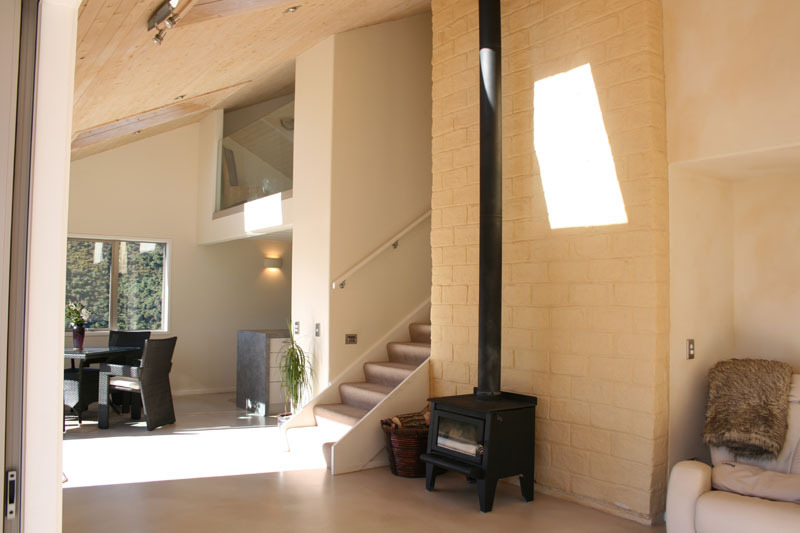 Locally produced cement-free adobe blocks make up the feature wall that contributes also to the thermal mass. The home was built for $200,000 (in 2004) but would have been less if not for the extra foundation work required for the soft ground. 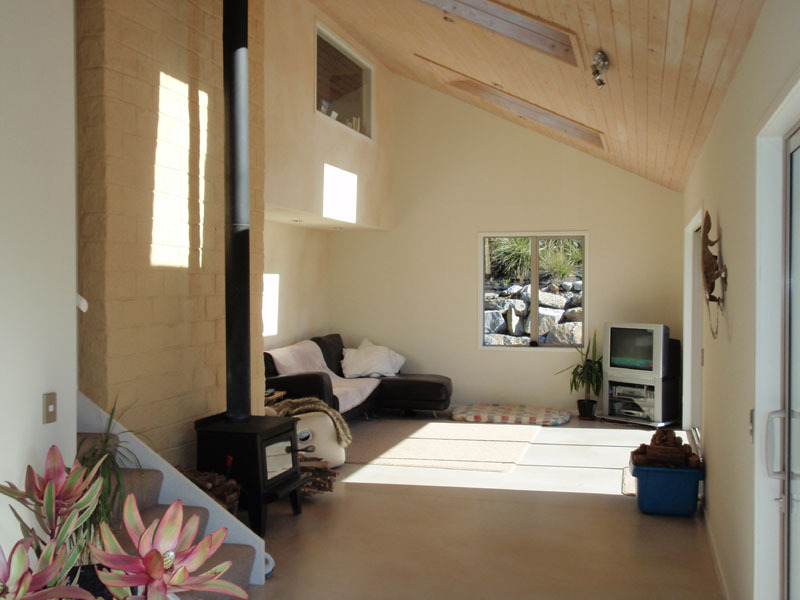 Interior of lounge showing winter solar gain irradiating coloured concrete floor and 150 thick Adobe feature wall both for thermal mass.